The DJ spun thumping Afropop and reggae tunes. And women rocked their hips, popped their chests and sashayed into other West-African dances. It was a new Saturday morning workout, booming out of a school's field in Robbinsdale. Near the end of class — the sun at its peak — Marie Chante began grimacing. "It's so hot," she said. "I need a break." Instructor Valerie Turner moved from the front of the class to Chante's side. "You got this," Turner coached. "You can do this. You've come too far. You got this." Together with Turner, Chante did, pushing through the countdown of backward kicks. The student-and-teacher moment is a glimpse into the supportive fitness community in north Minneapolis that nurtured Chante's 44-pound weight loss over the past five months. "I've worked out, on and off, for quite a few years now," said Chante, 39. "But this particular workout is more communal; it's almost like you're just hanging with your girls. It helps to build a healthy bond of sisterhood, so you know you're not alone on your journey." 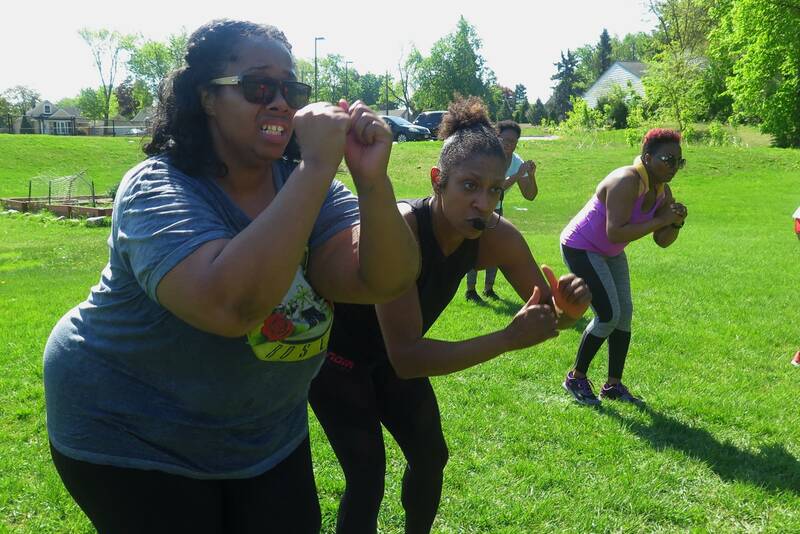 "We want to make fitness accessible to better the health of our community," Turner, 40, said, adding "the larger fitness community has ignored communities of color, because, as group fitness instructors, we're not in the clubs." Turner and Sandifer are driven to change that and improve the health of black women. 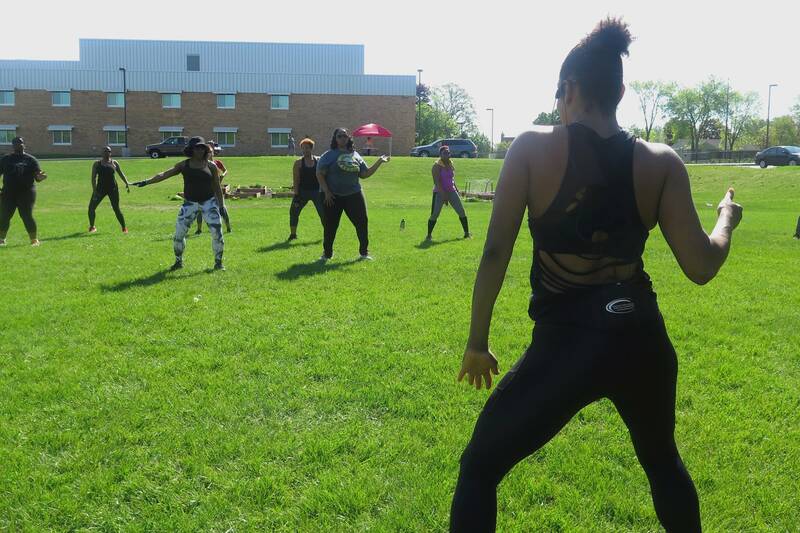 Their offerings, like Zumba and nutrition, are styled to the African-American cultural sensibilities — from music and dance moves to wellness plans that adhere to the community's body image ideal. Their classes are wildly popular, convening in community centers, health clubs and storefronts, mainly in or near north Minneapolis. And their mission, still in its infancy, recently culminated in a new business — Noir Elite Fitness, which offers healthy meals prep, retreats, activewear and the seasonal Saturday workout series called Jammin' in the Parks. The outdoor classes started in April. Two classes cost $15, and attendance increases every session as word spreads. "It's growing so fast that we already have an intern," Sandifer, 39, said. "We didn't realize how much people wanted to be in shape, but didn't know where to go. We just feel blessed that we have the direction for them." The surging interest is confirmation there's a market gap in north Minneapolis and around the Twin Cities, the women said. "Cultural specific offerings are so important because it provides a connection to one's root," Turner said. "And it is an essential part of who you are, like drumming and beat. It's a part of the African-American and Caribbean blood." She added: "As people of color we love community. It's important to have that as part of our fitness environment because it keeps us coming back." In general, African Americans are 77 percent more likely to be diagnosed with type 2 diabetes than their white counterparts. Heart failure is 50 percent more likely to occur in black women than white. Community health advocates said those national numbers jibe locally, especially in north Minneapolis. "Minneapolis is considered the healthiest city but Minneapolis also has some of the worst health disparities," said LaTrisha Vetaw, health policy and advocacy manager at Northpoint Health and Wellness Center, a Hennepin County clinic that serves north Minneapolis. "The white citizens in Minneapolis are very healthy. They bike, they walk, they have access to healthy foods. But in north Minneapolis we see greater disparities, especially among African-American women." The state health department's data isn't tracked based on a combined category of race and gender. But Vetaw said anecdotally she has seen an uptick in type 2 diabetes, heart disease, obesity and hypertension the past decade. The health of black women is paramount to the health of the community, because they tend to be heads of household and primary caregivers, she said. "Black women take care of everybody else before they take care of themselves," she said. North Minneapolis' lack of full-service supermarkets and high crime rates compound the problem. Finding fresh foods is a challenge in a food desert and a healthy stroll isn't an option when safety is a concern, Vetaw said. But there are other cultural specific efforts, like Turner and Vetaw's, underway that are mindful of the community's unique barriers. "We've figured out what people need, to not only to be healthier, but how to feel safe doing it," Vetaw said. Northpoint dispatches fitness instructors to housing complexes where residents don't have transportation. It also has a variety of group fitness options on-site and at community centers, including Zumba, taught twice a week by Turner. Vetaw said the demand for Turner's class is like no other. Recently, it was held in Northpoint's parking lot to accommodate the large turnout. "Some people are trainers and they teach, get paid and leave, but Valerie is passionate about it and wants to make a difference," Vetaw said. "And people are seeing results. If we could offer her class five times a day, five days a week we would." Sandifer said fitness is attainable for black women. She and Turner are examples. "We are proud to be black women that are fit," she said. "We're just trying to break that whole stereotype that we aren't in shape and we don't care about our health and well-being." It can be a prickly issue, though, without nuance from cultural awareness. But Turner and Sandifer get it from their own fear of losing their shapeliness to slimmer waistlines. "The body image ideal for black women does differ from what is upheld in mainstream America because we love our curves. That was one of the things I worried about as I was losing weight during my journey." Turner said reconciling fitness goals with a voluptuous frame can be achieved with cardio and weight training. Optimal health, not ideal body weight, is the focus. They provide women, for example, with physical fitness and dietary plans to lower A1C and bad cholesterol — resulting in weight loss. Vetaw said Northpoint's approach is similar. "That's why we focus on the numbers around diabetes and high blood pressure," she said. "That chart that says if you're 5'7", you should be 130 pounds, a lot of black women see that as skinny. And that's not attractive to them." Chante's never been skinny and doesn't aspire to be. She embraced her curves during adolescence. Still, she doesn't want to go back to 2014 when she was 370 pounds — her heaviest — again, either. Sandifer and Turner's Afrocentric approach is making a difference for Chante and in the lives of their other clients. Chante is down four dress sizes. Nakeisha Lewis, a 36-year-old new mom, dropped 30 pounds since incorporating Sandifer and Turner into her fitness plan in January. They attribute their success to the support system Turner and Sandifer created. It extends beyond workouts with off-hours encouragement and accountability buddy pairings. "They're even great about Facebook check-ins," said Lewis, a professor at the University of St. Thomas. "If they see me check in at the gym, they'll give me a 'like' or a 'love.' Overall, they are just great motivators in fitness and health education." The coaches' awareness of cultural aesthetics also resonates, Chante said. "I have coaches who not only go hard in the gym and in life, but they are black women who live ideal lifestyles that are conducive to the way I aspire to be," Chante said. Turner and Sandifer left corporate careers in IT and banking, respectively, and were teaching fitness classes separately in and around Minneapolis. Their paths crossed when they became lifestyle coaches for "Change Your Lifestyle. Change Your Life," a diabetes prevention program. The program is part of the national Black Women's Health Imperative and is funded locally by Medtronic Foundation. 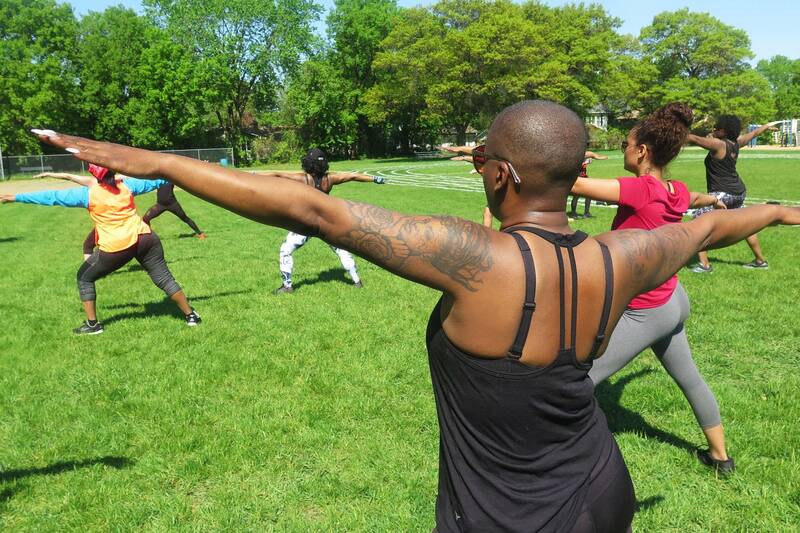 Fifty women, including Chante, are being coached to healthier lifestyles by Sandifer and Turner through the class. Sandifer and Turner decided to join forces by starting Noir Elite Fitness. Jammin' in the Parks is a 90-minute a mash-up of Sandifer and Turner's separate classes. Sandifer leads the strength-and-condition portion of the class. Then Turner does Zumba. 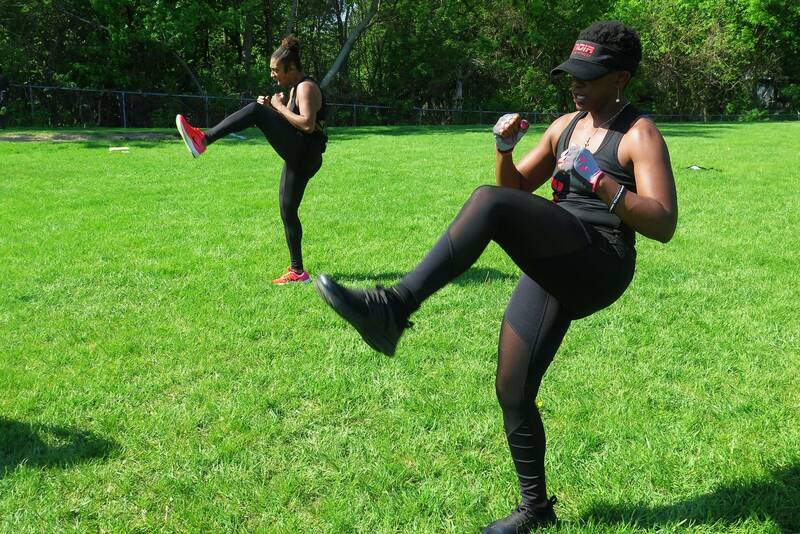 Cardio-kickboxing is led by both women. At a recent Jammin' in the Parks, "Mama Africa," the Afropop hit by Nigerian duo Bracket, was followed by "Shaky, Shaky," a reggaeton tune by Daddy Yankee. Grapevines and other traditional cardio moves were embellished with some Azonto, a Ghanaian dance. "As an African-American woman — a woman of African descent — I love it," Lewis said. "It's amazing to hear those beats and allow myself to feel rhythms. I feel like I'm connecting back to a familiar place." Chante wants to fit a size 10 dress by her 40th birthday next year. She works out five days a week with Sandifer and Turner. She's losing 3.5 pounds a week with the combination of lifestyle coaching and group fitness classes. And every two weeks, she adds a Jammin' in the Parks session to her regimen. "It's a pretty intense class," Chante said. "But when I feel like I'm going to give up, like earlier in the class, they are there, by my side. And I can call or text them anytime I need encouragement."